Modern syllabubs are made with an infusion of sherry or wine mixed with whipped cream. They are always served in tall glasses and should be left in a cool place for 8 hours to let the wine and cream separate. The wine is spooned up or drunk through the creamy froth in the manner of Irish Coffee. mix the sugar with the lemon juice. Add the grated rind, sherry and brandy. Warm slightly to dissolve the sugar and blend the flavors. Whip the cream and fold into the wine mixture. Pour into tall glasses and serve when separated. Variation: put some almond macaroons at the bottom of each glass, to absorb the liquor when it's separated. My favorite "elegant" dessert to make is Bananas Foster (Brennan's of New Orleans). Not only does it taste decadently good, it is performance art as you make it table-side. 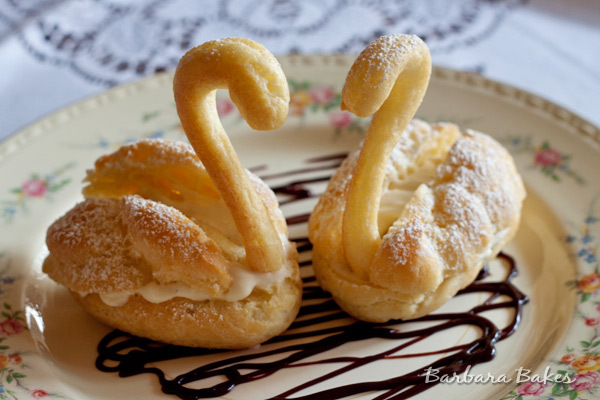 Fussy looking little pastries like these cream puff swans. They are really inexpensive and simple to make, can't get more elegant than that! Well, a mountain of whipped cream with a cherry on top is pretty elegant to me. We are blessed with growing raspberries. We have made peach melba, which is pretty easy and elegant. And to make it more so, for the sauce, chase the berries around in a circle in a food mill and remove the seeds. To me, a person who doesn't get excited about desserts, nothing beats preparing a dessert in front of your guests, or having one prepared in front of you. No town does it better than New Orleans... even if they are just making coffee, like the Café Brulot at Arnauds in New Orleans. Pavlova. GF makes a great one..light, fresh...I love it.. I used to make a torte with 8 layers using sponge cake, filled with a dark chocolate buttercream, topped with rolled up almond tuile cookies filled with brandy buttercream, with remainder of brandy buttercream piped around the bottom in rosettes or shells depending on my mood. Basically a Dobosh torte. Haven't made 1 in years, though I do make the tuiles every great once in a while.